Forget the beautifully cut strapless silk gowns with sheer overlays, the voluminous opera skirts, the swirling puff-ball mini-dresses, the classic-with-a-quirky-twist tuxedoes, pretty daisy embellishments and the pointiest of shoes with curved pin-thin heels… to me today’s Dior Spring-Summer 2013 show was all about just one element – the gorgeous, dramatic, unforgettable eye makeup. It seems that even as Raf Simons (who is clearly Designer of the Year according to me!) was blending colours, textures, traditions and innovations for his Dior debut at Paris Fashion Week, international makeup artist Pat McGrath was gleefully combining colours, clashing hues, playing with glassy glitter and in general having a ball with her eye shadow palette. The chunky, childlike glitter (not mere sparkles! ), vividly coloured crystals and intense pigments were drawn into her signature feline lines (eyes pulled upwards and outwards) for a look that was edgy, grown-up, cheerful and super-fun all at the same time. 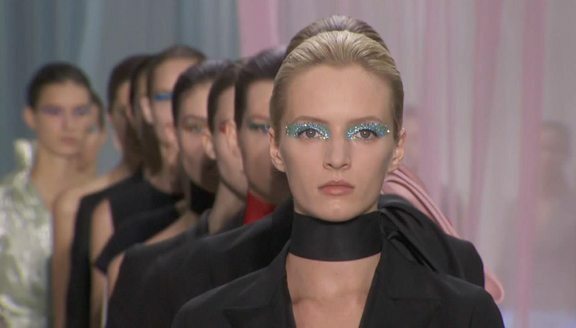 And if there is something that past shows have taught me, it’s that when Pat McGrath creates a beauty look, we are all going to be scrambling to recreate it very, very soon. Admittedly, this one may seem a bit too bright but you can easily take it from runway to real life by doing a broad cat’s eye in a bright shade and layering a dash of chunky glitter on the edges or along the lash line. Same aesthetics, less theatre, more wearability in real life. Don’t you think?